I always love a good challenge, and I love using my blog and the month of the year as a medium in which to attempt a challenge. If the challenge includes alliteration, all the better. This month, I am attempting, and inviting all of you to join me, if you so choose, to curb my bad shopping habits. I'll be frank; I'm a shopaholic. The first step to recovery is admitting you have a problem, and I do have a problem. This whole year, I've been on a journey towards Simplicity, which has had its ups and downs, but has in general been fairly successful. I've been working towards simplifying my possessions, my schedule, my faith and now, my spending. For the month of September, I challenge myself to set aside ONE day for doing all my shopping with the exception of ONE mid-week emergency trip IF NECESSARY. I will refrain from doing any shopping (which includes online) throughout the week until Friday, when I will do my full week's grocery shopping/other shopping. The exception will be if we run out of milk or bread or something totally necessary, on which I will be allowed one brief trip the store on Tuesday. I will aim, however, to avoid even the emergency mid-week Tuesday shop. My reason for this simple. When I go shopping, I tend to overspend. If I go into town for only milk, I will return home with three bagsful of stuff. Instead of spending just $4 on the milk, (milk is frickin' expensive over here! How I miss Farmfoods.) I end up spending $50. Also, I don't realise that over the course of the week how much these individual trips are adding up. However, if I do a lot of shopping all in one day, I feel very aware of how much I am spending and feel much more cautious. My thinking is if I save all my shopping for one day a week, I will first of all need to be much more organised in my meal planning and more realistic on how much we will need to get us through the week. I will also be less likely to spend money on things I don't really need, because I will see it all add up in that one day and will feel the burden of spending so much. I am choosing Fridays, because Fridays are Double Points days at Kroger, my grocery store of choice, which means I am also saving money on my petrol. I have given myself the option of a possible mid-week shop when necessary. I'd love to cut this caveat out, but realistically, I know that if we run out of milk mid-week, I can't avoid getting more. However, to help make sure this doesn't happen, I am doubling up on how much milk I buy on my weekly shopping trip. Again, this makes me see that even the cost of a jug of milk adds up, and I will see that plainly when I pay for my three gallons each Friday! But in case I have not estimated accurately, I am allowing a quick trip on Tuesday nights after soccer practice (with three kids in the car, a great deterrent) for mid-week top-ups. This challenge does not just include groceries, though. This is all shopping. If the kids need something for school, or new clothes, or if I realise I still haven't bought a whisk, or I really want a Wendy's Frosty, this all can only take place on Friday. Again, my thinking is that once I've seen how much groceries are, I'll be less likely to overspend on school supplies or new clothes, and a lot less likely to waste money on that Frosty. If we decide to have dinner out, it'll need to be on Friday. Not on Tuesday, either; Tuesdays are emergency clauses only. The one thing that I'm afraid may have to exist outside the challenge is petrol. While I'd love to say we'll only buy petrol for the cars on Fridays too, this is not realistic. Scott has to get to work, and unfortunately, if the light comes on on a Wednesday, well, he'll need to fill up. For myself, though, this challenge will help me include how much I drive my car. If I know I'm low on petrol, I'm hoping the challenge will help me consider whether or not I really need to get out in the car that day. After all, I won't be needing the car for trips to the store each day, so I won't be using the car as much anyway. 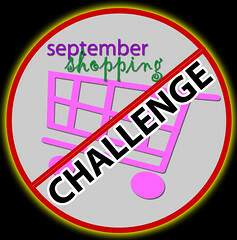 The September Shopping Challenge sounds okay to me from the outset, but I know it's going to be difficult - really difficult. I know things will come up, like, 'Oh no, I forgot so-and-so's birthday is this week!' and immediately I'll want to run out and gift shop. But I'm going to keep it to Friday. It means I'll need to be more organised about everything, but it also means that on Friday, I'll have more money waiting to be spent than I would if I made all those interim trips to town where extra money gets spent that isn't needed. Already, I can see how I'm going to find this hard. For instance, Monday is Labor Day, and we're going to my mom's for a BBQ. Scott and I are supposed to bring the ribs. I haven't bought the ribs yet. Emergency Tuesday will be too late, which means I'll have to break my challenge already on Day 1, September 1st. This makes me ill. It means tomorrow, the first day of my challenge, I'll have to go to the store on a non-shopping day to buy ribs, all because I wasn't organised enough on Friday past. (This challenge has been on my mind for a few days, and I knew I was doing it on Friday when I did my first Friday shop.) So it means that tomorrow, a Sunday, I'll have to be absolutely, completely self-controlled; I'll need to walk into the grocery store, head straight to the meat, and head straight for the checkout. Do not pass Go, do not collect (or spend) $200. Then vilify yourself the whole way home on screwing up the challenge one day into it, vowing not to screw up again. So, who's going to join the challenge with me? You pick which shopping day works best for you, and if you blog, or use Facebook, keep us all up-to-date on your progress. I'm going to be using my blog for accountability; I will document my successes and my failures (hopefully more the former than the latter). Let's see how much money we can save in September by just saying NO to shopping!